by having your club plan and implement acts of kindness! cheer up a random stranger, for no reason other than to make people happier. If your club can answer the call for kindness, read on for some ideas to get started. Do not feel limited by the inspiration outlined here. These are just examples of the types of things your club could do to spread cheer. Can you identify a way to make this a group activity? Will it cost your club money and is that in the budget? If it costs money, would you need to raise funds or ask members to contribute to afford your idea? and/or video that you can then use as a membership and engagement tool? Is this something you could repeat or replicate for future acts of kindness? How can you maximize the impact of your kind activities? The challenge also includes that this Act of Kindness is a new project for your club! If you ring the bell for the Salvation Army every holiday, pick up baked goods each week to bring to the local food pantry or raise money each year to support a youth program, please continue to do that great work for those in need, but this activity should be something new, different and in addition to that work. Also consider that it not be providing a basic need, but rather something that people will enjoy above and beyond that, to put a smile on their face in that moment. For example, provide hand-written letters of encouragement and support for the food pantry to put in the packages of food they distribute so that people get fed AND get a smile. Imagine yourself in the shoes of someone in need. Receiving gifts of food, clothing and shelter are certainly a blessing, but knowing that someone wants you to feel special is truly a kindness they aren't likely to receive very often. Finally, when documenting your Acts of Kindness (both for your club's public image purposes and to submit to the district), remember that we are people of action! We want video of people doing the work and action shots of your members performing these Acts of Kindness, not just people standing in a row with a sign or a giant check. As much as possible, please continue to shift how we think about documenting club activities by capturing Rotarians as people of action! Taking quality photos and video of your club's Acts of Kindness project is not just so you can use it for public image, but also so you can enter to win a prize. 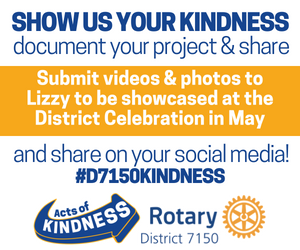 All clubs should submit the images from their project to the District Celebration committee - either Jenny or Lizzy - by April 1, 2019 to be considered to win. Top three projects, as determined by the committee, will win a prize their whole club will find useful. with a chance to win $1,000 in cash for their club!